The beautiful pink Save the ta-tas inspirational planner is part of their "bloom gives back" line and a percent of all proceeds goes to the save the ta-tas, benefiting breast cancer research. Be sure to join the Bloom Daily Planners mailing list and gain access to free printables, exclusive deals and more! 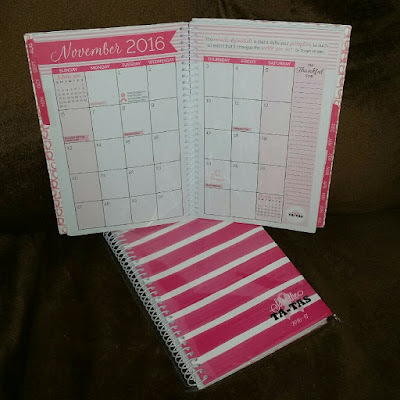 Disclaimer: The Being Frugal and Making it Work family received a complimentary Save the Ta-Tas Inspirational Planner for the purpose of writing a review and hosting a giveaway. Regardless, I only recommend products or services I would use personally and/or believe will be a good fit for my readers. The views and opinions expressed on this blog are based purely by our own experiences. No monetary compensation was received. Results may vary. I'm always looking for a great planner! I wish you great strength and a positive outcome through this tough time. This looks like such a great initiative! These are beautiful, thanks for the chance to win one of my own! Planners really help keep my organized and this one looks awesome! Hard cover vintage florals is also so cute! I love, love, love planners! I have several and always by more! Having a daily planner is seriously my lifesaver! There is something about writing a to-do list everyday and crossing off each item that makes me feel so accomplished at the end of the day. It's always good for me to have a planner, it makes life much easier and less stressful. I also like the Ultimate Planner and Notebook, it has a great cover. I also like the Peacock Feathers cover design! I would love to have the Best Year Ever hard cover planner. I think that it is so pretty!